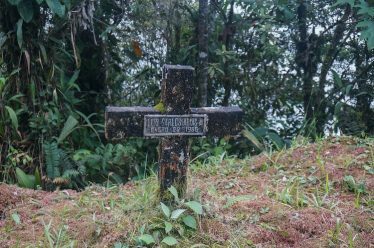 As you can imagine, the death route is not popular among bicycle tourers. 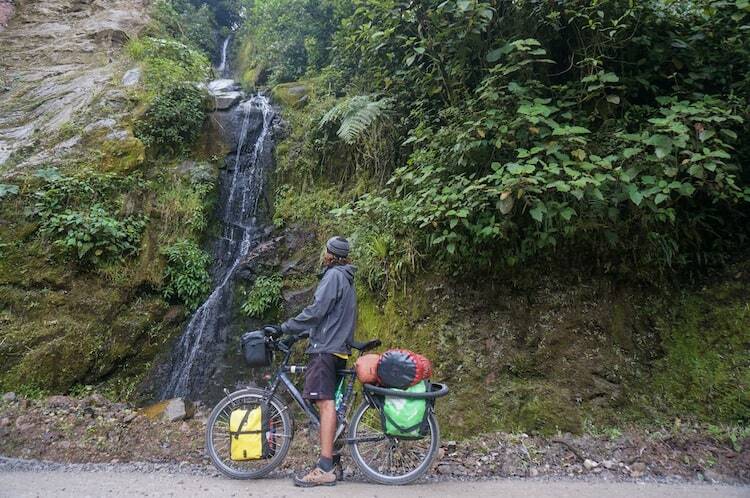 It seems that everyone travelling on a bicycle is looking for secluded spots, beautiful scenery and challenging roads. The Bolivian stretch can be beautiful but it loses its appeal with the crowds and the show set up by tourist companies. 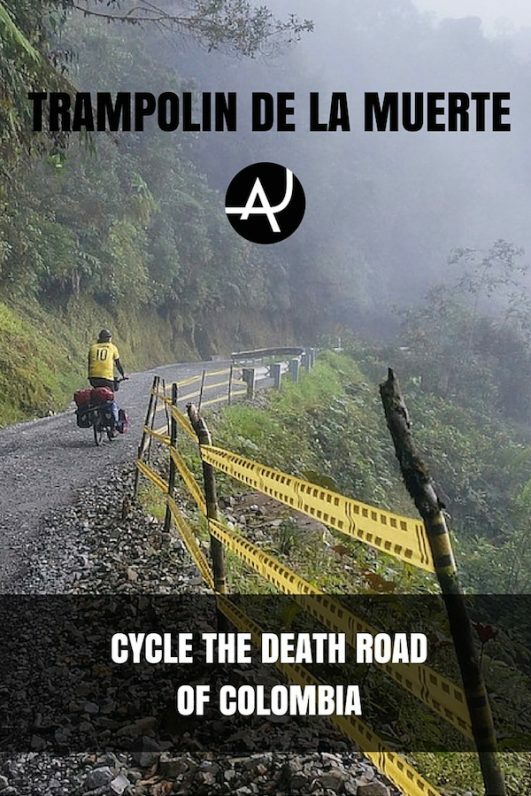 However, Latin America is full of dangerous, pretty and challenging roads and a very popular route for cycle-tourers is the famous Trampolin de la Muerte, in the south of Colombia. Here, there are no tourist companies. You will have to climb the hills by yourself, deal with narrow passages and crazy drop-offs, carry all your stuff with you and bring your own snacks if you want them. As you might have guessed, no t-shirt is included with the ride. But what you do get is 60 kms of pure wilderness, challenging roads and very light traffic. A no man’s land, a place to connect with nature where you can find solitude and enjoy some of the best landscapes of an already very beautiful country. 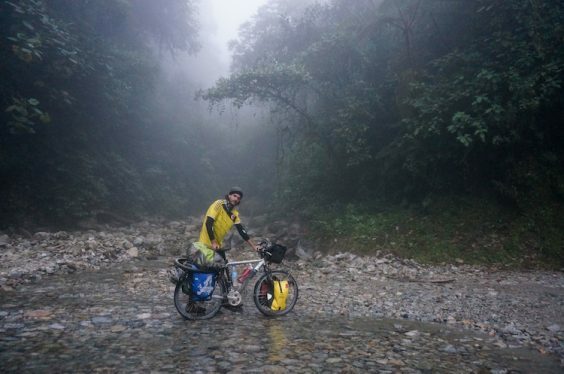 To reach the start of the route you will cycle through the Valley of Sibundoy, a place that is well worth exploring for a few days. 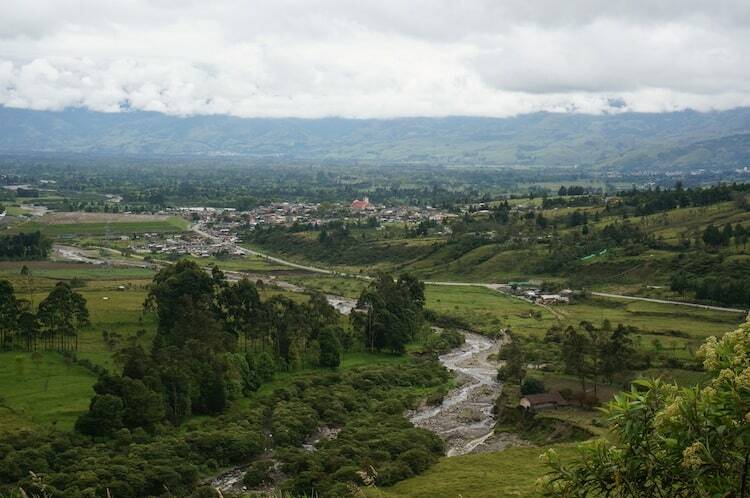 It’s gorgeous, cheap, dotted with small Colombian towns and great scenery, and no tourists seem to travel this far. The route itself starts in the tiny town San Francisco where the pavement ends. There is one hotel in town that offers double rooms with private bathroom and wi-fi for 20,000 COP (8 USD) and plenty of camping opportunities on the outskirts. There are 2 main passes to climb on route before you start the long, windy and steep descend into the Valley of Villagarzón. The first climb is in much better condition. 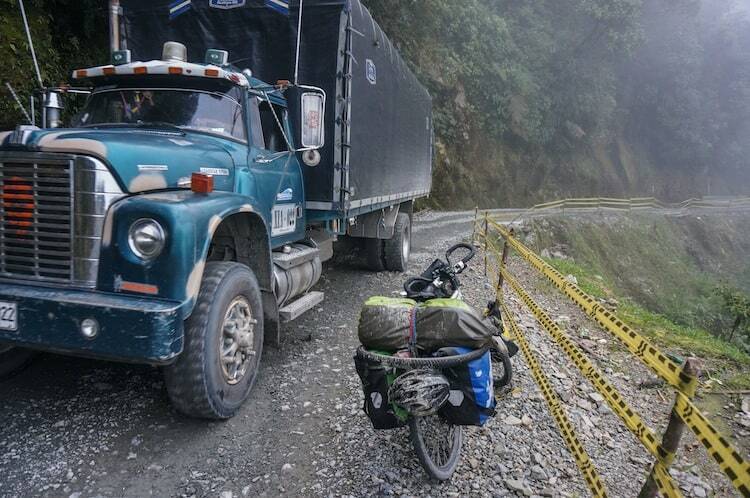 The gravel road is more compact and there are less stones on the way. After the first pass, the dirt road gets worse as it looses its consistency and you start to encounter more and more rocks on the way. That’s the main reason why it’s recommended to cycle the Trampolin de la Muerte north to south, rather than the other way, apart from that there is less climb involved. There are no settlements on the way. A couple of small places to stop for a ‘tinto’ (aka Colombian coffee) after the first pass, a restaurant before the second pass, a shop at the top of it and a little restaurant at the mirador (during the descent). That’s it. All the rest is incredible mountain views and roaring waterfalls. We started late. Too late. It was 9:15 AM when we left San Francisco. We were waiting for the skies to clear but that never happened. It seems that a little drizzle is the norm here, in a valley that usually wakes up covered by the clouds. As soon as we cycled the first couple of kilometers we knew we were in for a great ride. One of those routes you will talk about again and again. The grades were reasonable, the dirt road compact, the traffic light, the air fresh and the views over the Sibundoy valley were simply spectacular. We made it to the top of the first pass, the highest point of the route at 2.700 meters and life never felt any better. 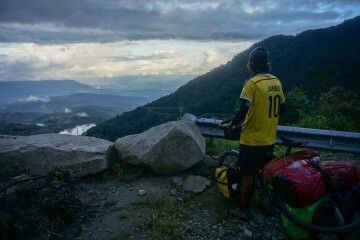 Now is when we started to wonder what the heck we were doing cycling the Panamericana all this time. After a compulsory ‘tinto stop’ we start descending and we realised the beauty of this route is only just starting. 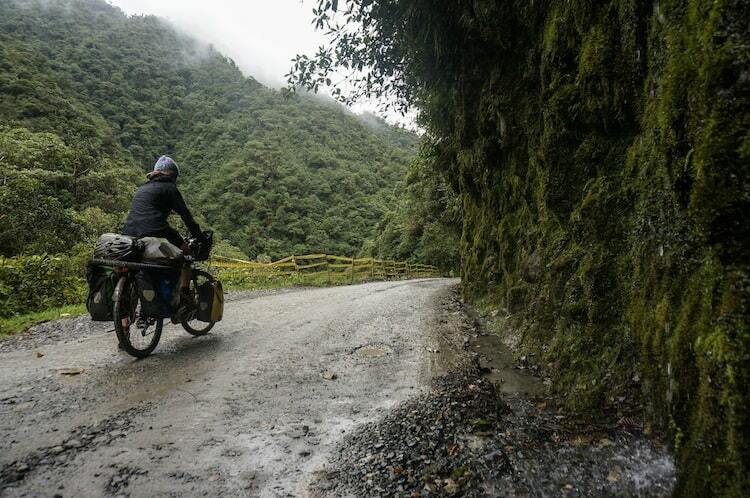 The mountains get bigger, the road narrower, and the drop offs…I just prefer not to think about them. Also the fog appears making everything misty. We turn our lights on and start climbing to the second pass. This time it is a lot harder. We have been cycling for 4 hours already and the road is in very bad condition. 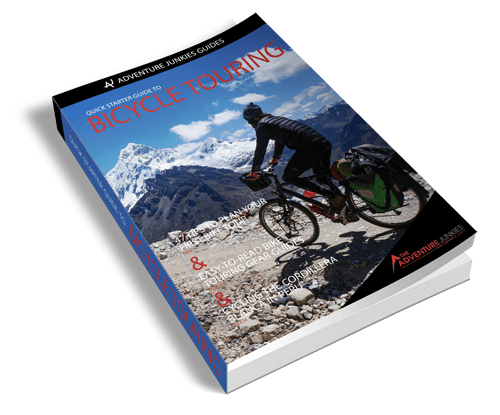 Tons of rocks make pedaling difficult and cycling over 5 kms/hour becomes virtually impossible. We fight every meter until we can see a military check point. That’s the reference. We are at the top. The climb is over. 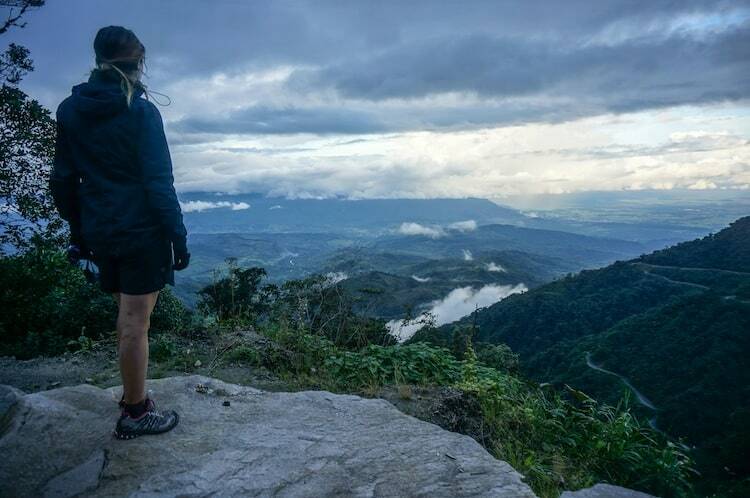 I kiss Amanda, we congratulate each other and we get ready for the most impressive section of the Trampolin de la Muerte and, for us, probably the most spectacular riding of the whole trip until date. It was already 4:00PM when we got to the top and the decent turns out to be slow, windy, challenging and with several river crossings. There are also many photo opportunities which makes us go very slow in this section. The views over Villagarzon are impressive but we also realise the town is far, too far. We cycle down the mountain as fast as we can but the night caught up with us. With almost no brakes, because of the intense descent, and in pitch dark we work our way to an area with some houses but no towns. Eventually we make it to El Pepino, where a roadside restaurant has rooms available. We can’t hardly walk. We are full of mud and soaking wet. The day has been tough and intense, but also beautiful and rewarding. A ride I will not forget in a long time and that I will probably share with my friends over a beer many, many times. START EARLY. It’s a long and tough ride and you will want to stop lots of times to rest and take pictures. 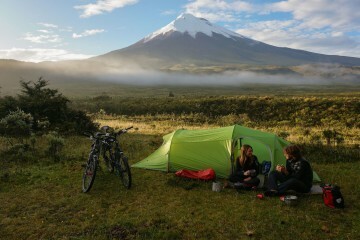 Allow at least 8 HOURS OF CYCLING (San Francisco to El Pepino) plus rest stops. The area is always cloudy and misty. So DON’T WAIT UNTIL YOU HAVE CLEAR SKIES to cycle this stretch because that might happen only a few times a year. The descent from El Mirador to Villa Garzón is slow, with lots of sharp turns, narrow sections and plenty of photo opportunities. ALLOW AT LEAST 3 HOURS TO GET DOWN from the top. There are 2 main passes to climb on this route. The first one is at the beginning and it’s about 8kms long. The dirt road is compact, there are not many stones and the grades are reasonable. Some muddy parts but the condition of the road is pretty good in general. Then you have a descent followed by an up & down section. 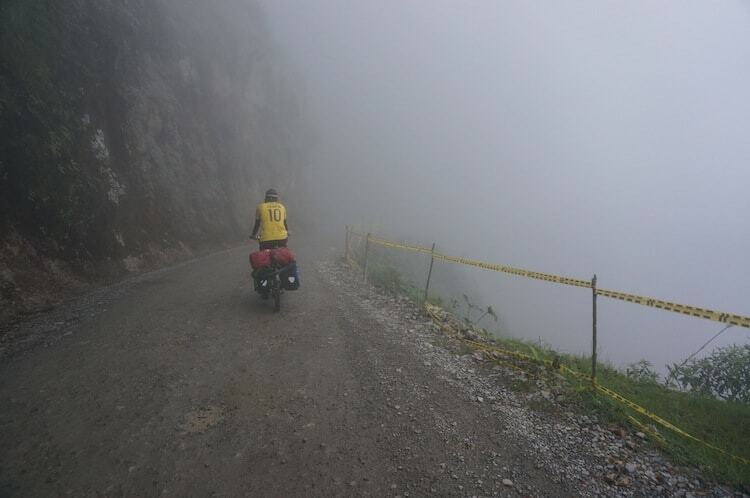 After that, you get the second climb (around 7 kms) that is much harder than the first one mainly because of the condition of the road (lots of stones). Once you reach the military check point, the rest is all downhill to Villagarzón. The route is 69kms long from San Francisco to Villagarzón. 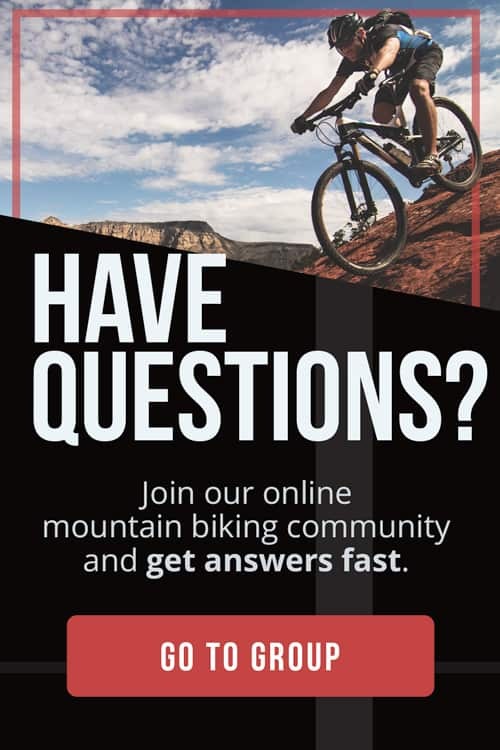 It takes about 8 hours of cycling plus rest stops. Leaving early is a must. The region gets a lot of rain but it’s mainly drizzle. You should avoid the rainy season (March-April and October-November). Although, we went at the end of April and had a good day. The easiest way is to stay the night in San Francisco and start cycling early in the morning. This way you can start cycling El Trampolin de la Muerte straight away. The beauty of the landscapes. The views are really spectacular. The traffic is very light, making the cycling very enjoyable. It’s a challenging yet rewarding climb. The very few drivers you encounter are very impatient towards others on the road. 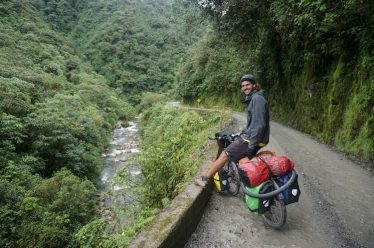 Bicycle Touring El Trampolin de la Muerte has been a cycling highlight not just of Colombia, but of the whole trip for us. It’s a tough ride that requires effort and perseverance but the incredible sceneries you go through are well worth the effort. 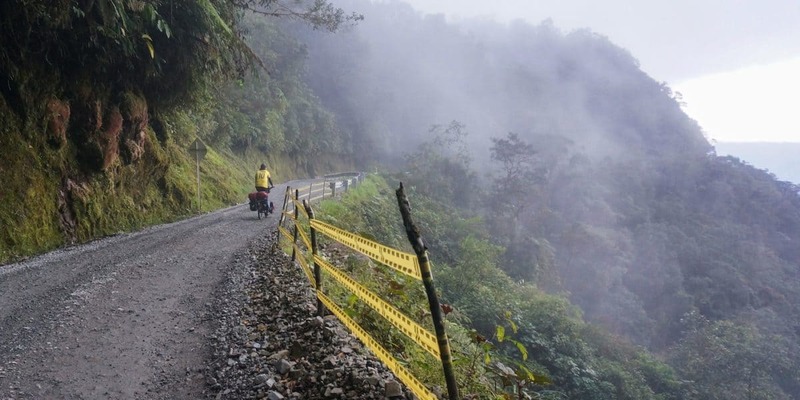 It’s also a great alternative to cycling in the Panamericana through Ipiales and into Ecuador. 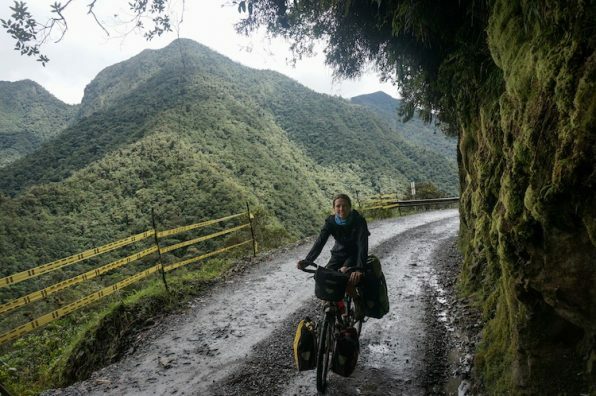 To get to El Trampolin de la Muerte you will need to cycle by the Laguna La Concha and Valle de Sibundoy, two fantastic places for bicycle touring.